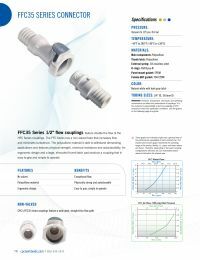 The FFC35 Series 1/2" flow couplings feature twice the flow of the HFC35 Series couplings and are able to withstand demanding applications and feature physical strength, chemical resistance and autoclavability. The FFC35 has a non-valved bore that increases flow and minimizes turbulence. Note: A restocking fee of 25% will be charged on returns for Colder FFC35 Series Couplings.